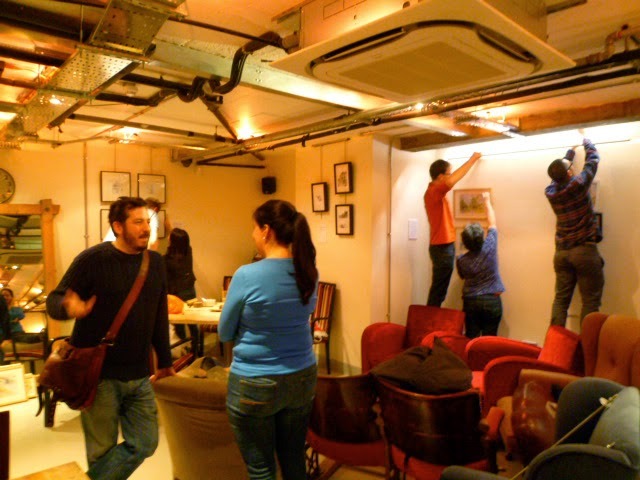 I have four drawings in a group show of work by London's Urban Sketchers at Timberyard cafe, Old Street, London, until the end of June. Thomas Corrie, Isabelle Laliberté, Jhih-Ren Shih, Katherine Tyrrell and Zhenia Vasliev are co-exhibitors at the cafe, which is a popular place for freelancers and e-workers to settle in for the day. That may well be where you are as you read this. The coffee is good, isn't it? 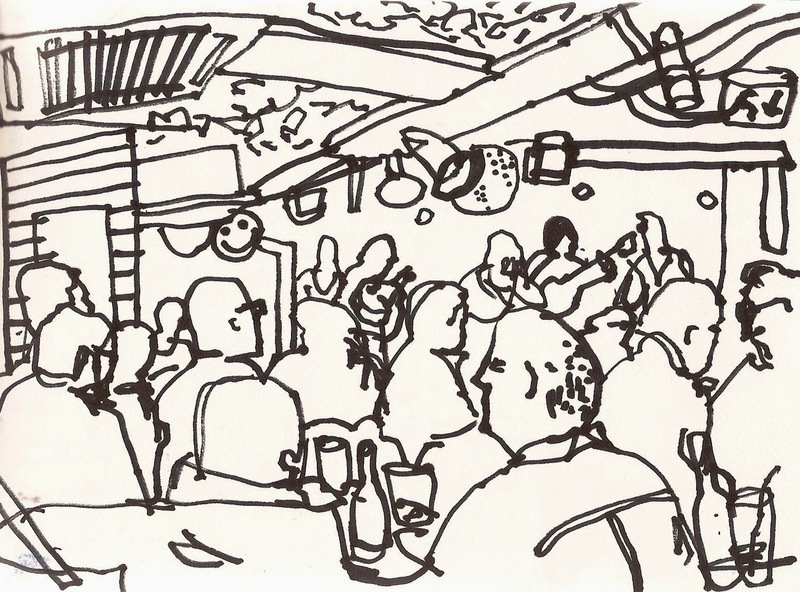 I spent an enjoyable evening last night at a gig by Jay Scott and the Find at the Underbelly, Hoxton Square, where we'd been invited to draw by the band's management. This is not my usual choice of subject; as with drawing in the BBC studios in January, it was a challenge to draw a scene that wouldn't usually get me reaching for the marker pen, but that is no reason to back down. 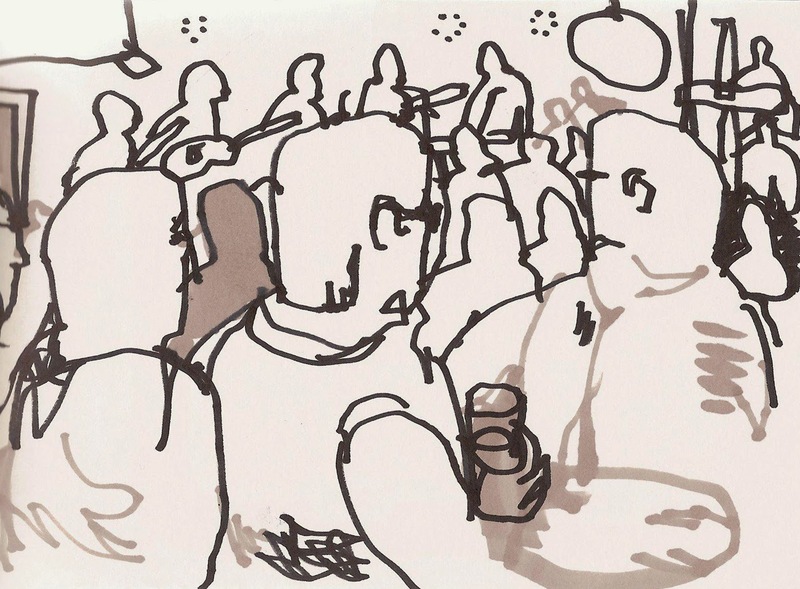 The low and changing light levels, the liveliness of the audience, and perplexing problem of drawing while holding a bottle of beer all contributed to the outcome. Our thanks to Jay Scott and the Find, who have a new album out soon. Last weekend we drove down to Devon to meet up with old friends to remember and celebrate the life and times of Jonathan Young, who had been a good mate since we met at school in 1972. He died from a heart attack in Italy last November, where he had lived in beautiful rural seclusion with his wife and five children for several years. The reunion, of around 40 of us in the back room of a pub where we were refreshed by beer and curry as JY would have wanted, brought together people we hadn't seen for more than 30 years, and a feast of unrestrained nostalgia for what really were good times. I won't go on about what a kind, funny, lovely man he was, or about how much he is missed by his family and friends, but understand how true this is. I drew this as N drove us back home to London along the M4 motorway as we dwelt on the weekend and our memories of him.